Make a Difference Saving Lives! The NKKC (Japan Emergency Rescue Agency) is renowned as the "Wings of the Rising Sun" – first-responders dedicated to saving lives anywhere, from Earth to Luna. When disaster strikes, these heroes deploy from fixed bases and orbital drop ships to provide aid to any country that will accept their help. Transhuman Space: Wings of the Rising Sun lets you step into the shoes of these hazard-hardened humanitarians in a campaign packed with action, drama, and surprises. Learn all about the NKKC: its history, philosophy, staff, and organization; how it relates to Japan and the rest of the world; and why its memetics division is as top-rate as its rescue squads. Create your own rescuers using templates for ghost/infomorph, bioroid, and human/parahuman operatives – or dial it back a bit as a researcher or a memeticist. Explore the Agency's offices: on Earth, the "rabbit hutch" on Luna, and the 47 Hakenshitsu satellites in LEO, with full GURPS Spaceships stats for the latter and their drop ships. Save lives with specialized NKKC technology – Rodasha and Xenocop bioroids; Aibo, Kikko, and Tenryu cybershells; and custom microbot swarms – or drop it into your existing Transhuman Space campaign. Use the campaign advice and adventure seeds to throw operatives into a wide range of disasters, from wildfires on Earth to explosive hull failures in space. In 2100, there are countless people taking, ruining, and exploiting lives . . . but if you want to be the group saving lives, Transhuman Space: Wings of the Rising Sun is ready to jump in and help. Join the NKKC and understand why their motto is "Even One More." 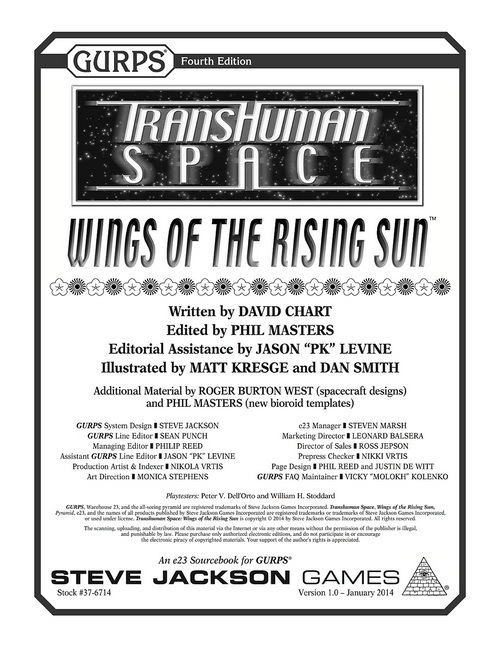 Transhuman Space: Changing Times – A GM guide, campaign book, and GURPS Fourth Edition conversion for Transhuman Space, written by Phil Masters. Transhuman Space: Shell-Tech – Cybershells are everywhere in the world of Transhuman Space; this book brings these game details up to date with GURPS Fourth Edition. 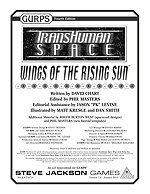 Warehouse 23 offers more worldbooks, supplements, and adventures, in physical and digital formats, for Transhuman Space. The Transhuman Space alliance calculator, by JHG Hendriks, calculates the population and world power of whatever alliance of nations you wish to create! See what they're saying about Transhuman Space. Discuss Transhuman Space in the Steve Jackson Games Forums.